When I was little, corn on the cob in the stores was yellow and starchy. I will never forget taking a trip with my parents to Pennsylvania and stopping at a stand to buy corn. We brought it back to my grandparents to eat and I had never tasted anything like it. 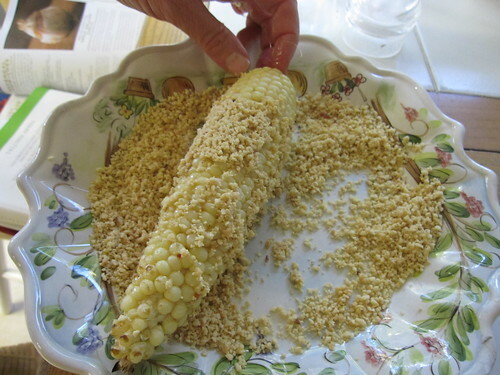 “Now THAT is how our corn tasted on our farm,” my mother exclaimed. “We used to boil the pot of water, run into the fields to pick the corn, quickly shuck it, and then drop it into the boiling water for exactly 3 minutes.” My dad chimed in with his Midwest memories, where white corn grew in abundance “White corn is the sweetest,” he insisted. I drooled at the thought of being able to have such a magical food all summer long. 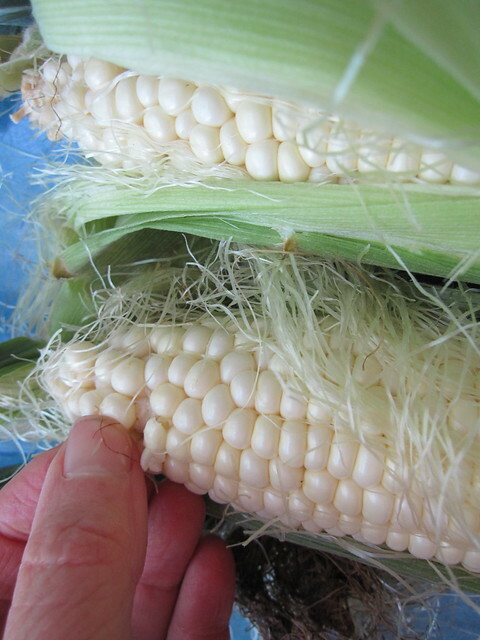 White corn showed up in my neck of the woods in the late 60’s at Chino’s Farm in Rancho Santa Fe. We would drive to the stand, 20 minutes each way, for our Saturday night summer family feasts and we cherished each ear of corn as if it were gold. My parents didn’t even flinch at the high price since each bite brought them back to their childhood. Sweet, juicy, succulent…there is nothing better than fresh corn on the cob. Today, we can get cheap and abundant fresh, white, sweet corn at our local grocery stores and farmer’s markets thanks to plant hybridizers who have developed all sorts of new varieties of white corn that retain their sugar content for a longer period of time before turning to starch. But there are still some tricks to picking out and cooking corn to optimize flavor and sweetness. 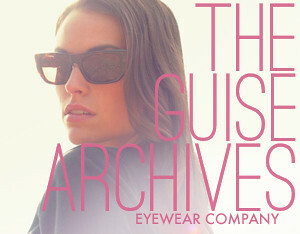 If they are too large, I keep searching. 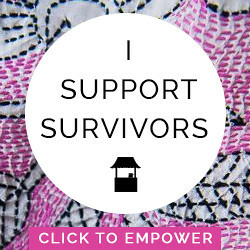 (Make sure they are developed, however. If they are really small and without color, they aren’t mature). The other thing to do is to pierce a kernel with your fingernail. If the juice is clear, it’s a fresh ear with a high sugar content. If it is milky or dry, it has turned to starch. I even sometimes sneak a kernel from the top and taste it. Then you know for sure that it is sweet! 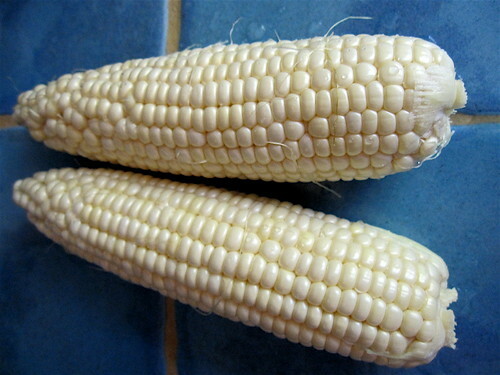 Always buy corn the same day you are going to eat it, store it in the refrigerator and shuck just before cooking. 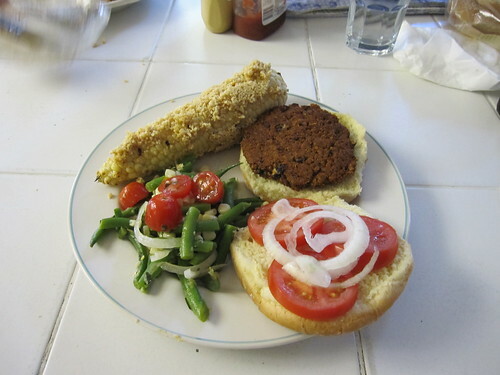 Often our no-fuss summer patio dinners consist of several salads (including a fruit salad and green bean salad), veggie burgers, and always, fresh corn on the cob. 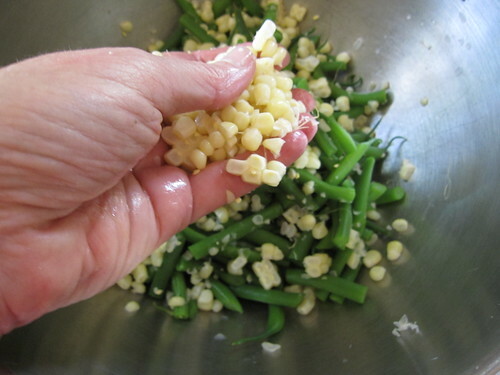 Bring a big pot of water to a boil, add corn, and bring back to a boil. Boil for 3 minutes. Serve immediately with butter and salt and pepper for those who want it	(I like mine just plain!). 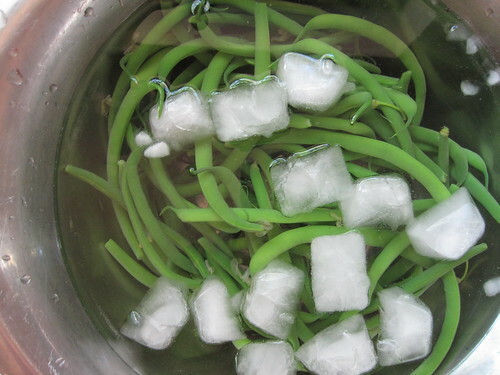 I always cook a few extra ears so I can use them the next day in salads such as the green bean salad below. The simplest way to grill corn is to remove loose husks, cut off any silks that are exposed, and then soak the corn for about 39 minutes in a large tub of water, placing a weight on top of it so it is completely submerged. When time is up, pour out water and grill, turning 3 or 4 times, for 10-20 minutes. Don’t worry if the husks get brown or burn. 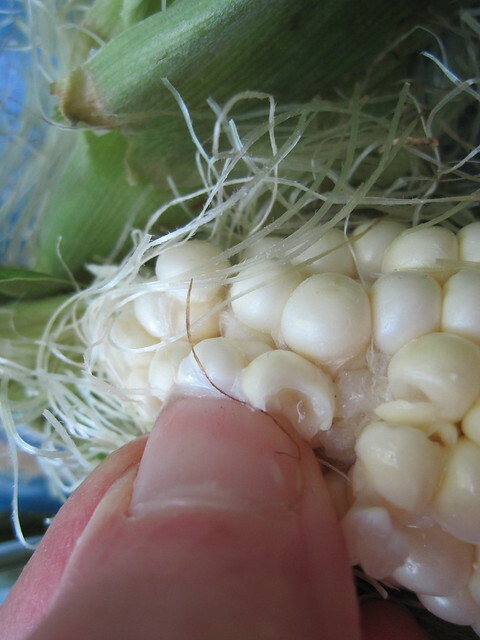 If you want to be a little fancier, after you soak the corn, pull back the husks on each ear, leaving them attached at the stem, and remove the corn silk. 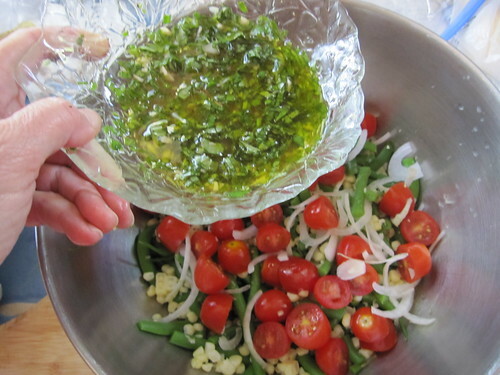 At this point you can spread softened butter mixed with chili powder or paste or herbs. Cover back up and tie at the top with a thin piece of cornhusk and grill. Lime juice goes great with this, too! 1.Brush grill grates with oil, and preheat grill to medium. 2. Whisk together coconut milk, brown sugar, soy sauce, lime juice, lime zest, and chile-garlic sauce in bowl. 3. pulse peanuts in food processor until finely ground. Transfer to large plate. 4. 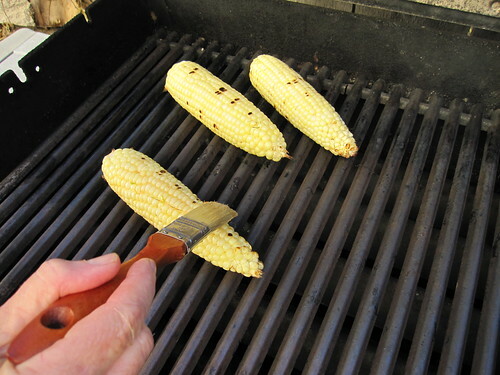 Place corn on grill and cook 8 minutes, or until browned and lightly charred in spots. Turning occasionally. Brush with half of coconut milk mixture, and grill 2 minutes more. Transfer to platter. Brush with remaining coconut milk mixture and roll in peanuts. I love adding fresh corn (cooked or raw) to salads. 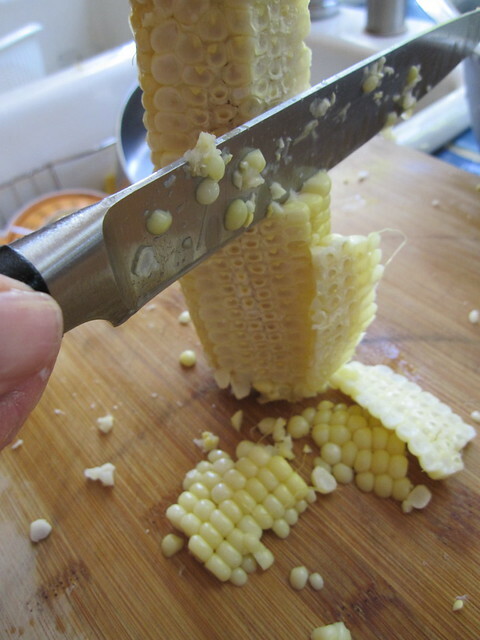 First cut the corn kernels off of the cob using a very sharp knife and using your fingers, break them up into their individual kernels. 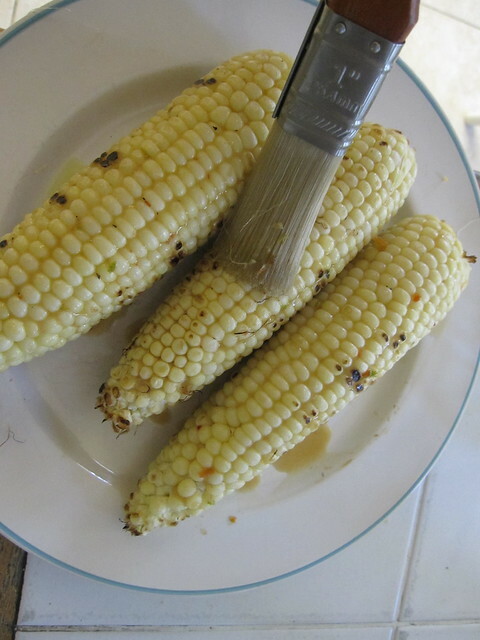 Then use the back side of the knife to strip down the cob to get the inside of the kernels left on the cob. 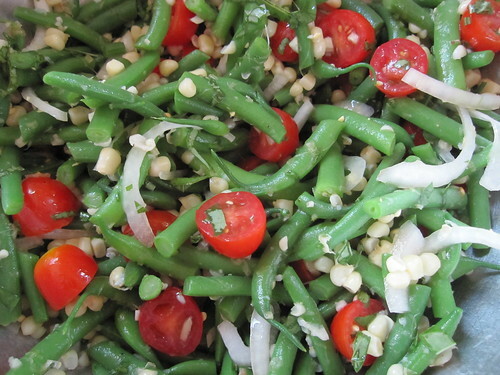 Right now I have an abundance of green beans in my garden and green bean salad is one of my summer favorites, so I added corn and made this easy salad. You can either use the corn raw or after it has been cooked. Bring a pot of water to a boil. Cook corn for 3 minutes and set aside. 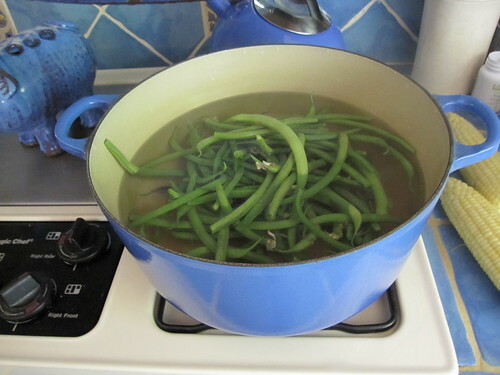 In the same cooking water, cook beans for about 2 minutes. Beans should still be crisp. Immediately drain and plunge into ice water to stop cooking process (you can add the corn to the ice water, too, to cool it down). 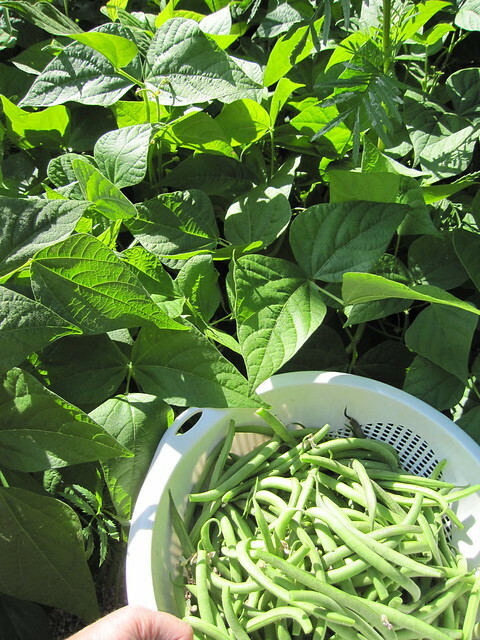 Cut beans into 1½ inch pieces. Toss with all ingredients and season to taste. -It’s delicious in quinoa salads, bean salads, and is fabulous in salsa with onion, black beans, lime and cilantro. - And don’t forget stuffed quinoa peppers which uses lots of lovely summer corn and makes a great company dinner! Enjoy your summer corn! And happy 4th to those celebrating this weekend! Those quinoa veggie burgers look amazing - can you share the recipe for them sometime? 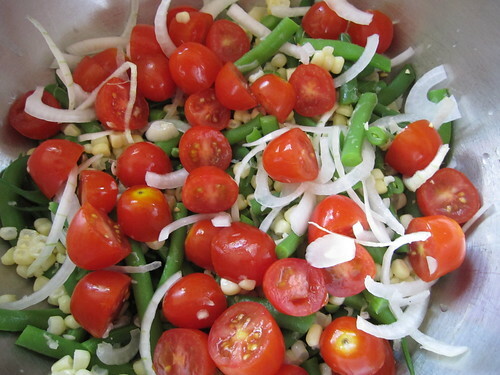 The green bean, corn, tomato, onion salad is being eaten at my house for dinner tonight!! 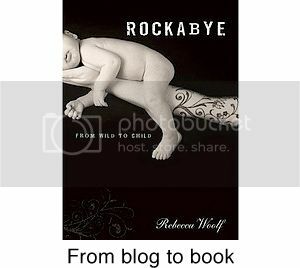 Can't wait and thank you for sharing!!!! I always boil corn for a lot longer...yikes! Have I been doing it wrong all these years? I will try the 3 minutes next time I buy corn. 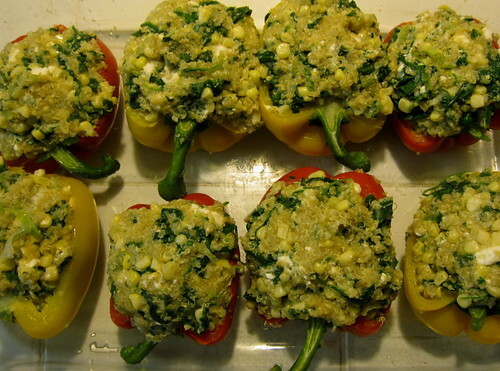 I am so making the quinoa stuffed peppers this weekend! However, I can't do spinach (so sad). Do you think arugula would be a worthy substitute or maybe chopped broccoli? Or should I just omit it and not worry about a substitute? I'm open to suggestions. WWW, your posts are always so fun. Thank you! Thanks for the tips on picking out a good ear of corn. I always just grabbed some and hoped for the best! Now I know how to choose. This is exactly what I am craving! Thanks! Jessica, you can substitute any green for the spinach. Arugula would be great as would swiss chard or kale. I love fresh corn! We buy it at the farm down the road and it's so sweet! This brings me back to when I knocked out my two front teeth and my folks had to cut the corn off for me, then a few years later one of my brothers knocked out his four top front teeth, more cut corn! ooooh hot damn ... that all looks like HEAVEN. My mom had a copper IUD and had to get it out. That's because nearly hemorragic periods run in the family, and the copper thingy was making those 4 to 5 days of the month a living hell. 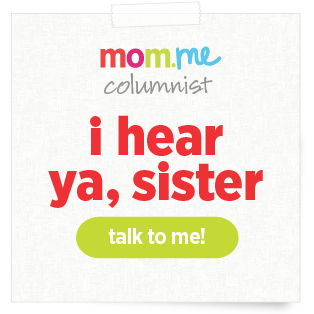 I'm childless though, so I can't really give advice. What I know is that if I were you I'd have my tubes tied. In fact, I'd have my partner have a vasectomy because it's reversible and less invasive. I get that you don't want to press Hal and that's super cool, but it's my body and pregnancies are quite draining and a little snip is nothing to be worried about in comparison. I was looking for a fresh, healthy side dish for the 4th of July. This year I ditched the burgers and potato salad and forced my family to eat healthy. 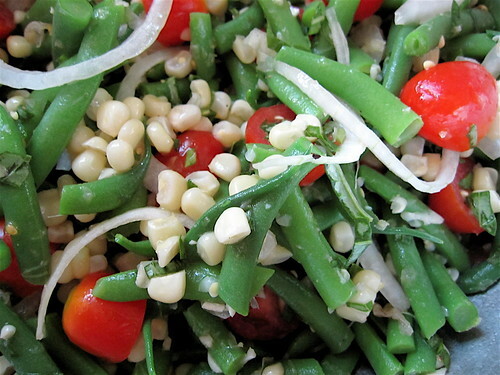 This green bean and corn salad was very well received. I'm excited to eat the leftovers! Thanks!